I've been setting up my first kit but I'm running into issues when attempting to place the bridge. When I measure it out I seem to have an extra 1/2"-3/4" (12.5mm - 19mm) more than what I should. The length from the nut to the twelfth fret comes out to 12 3/4" (323mm) but even when extending out the saddles as far as they will go I still get about 13 1/8" (333mm) from the twelfth fret to the saddle. Because it's a telecaster bridge the pickup route prevents me from moving the bridge at all, and even if I were to cut out more room for the route the pickguard would still prevent it as the bridge would then overlap the pickguard. I'm not sure what I'm doing wrong here. I've spoken to a representative at Pitbull and they say all my equipment is correct, so I can't figure out why my measurements are so wrong. I've included some pictures for reference. Any help would be greatly appreciated as this is my first build so I'm still learning. Hi Josh. It's best to measure the complete scale length from nut to bridge. So you should have 648mm from nut to the high E saddle, with the saddle positioned forward of the half way mark on the intonation screw. All of the other strings will be slightly longer for intonation. So as long as you have decent adjustment backwards you should be fine. 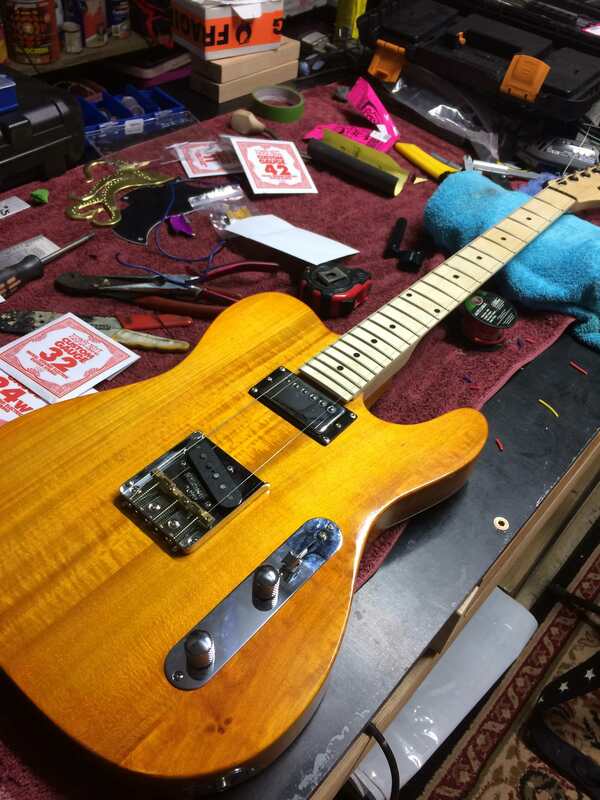 People often find on the Tele kits that the bridge cavity route needs to be slightly enlarged, particularly if fitting an after market pickup, or to make the gap between the bridge and the pick guard even all the way around. I've done 2 TL kits and have moved the bridge forward 2-3mm on both to give me a little more meat on the screws for adjustment. You can use a dremel or a barrel sanding attachment on a drill to achieve this fairly easily. Just mark the bridge outline so you can be sure all your work will be hidden after assembly. If you have a look in these threads you can see my hatchet work. Messy, but effective and hidden. In the first thread you can see me asking the same question at the time - it's a common area of confusion. With the bridge saddle extended all the way forward, from nut to High E saddle is still just about 1/4" (6.5mm) longer than it should be coming to a total length of 25 3/4" (654mm). With the saddle in the middle it's nearly a 1/4" longer still. The kit description says that it is supposed to come with a 21 fret neck which is typical for Tele's, however my neck is 22 frets. Pitbull assured me that it would still work though it seems to me that a 21 fret neck would almost exactly correct the distance issues I'm seeing. The fret count shouldn't make any difference. The 22's just have an overhang past the end of the heel. That said. Something isn't right. It does sound like you will need to enlarge the cavity a bit and push the whole thing forward. Can we see some more pics of your set up for measuring and the kit itself? Which variant of the TL is it? Is the neck seating nicely in the pocket? Basically I bolted the neck on and measured it that way so the neck would be stable when measuring. It seems to fit fairly well in the pocket from what I can tell. I'm wondering if they make longer saddle screws to allow me to basically scoot the saddles up by about a 1/2". I have plenty of room for that on the bridge if those are available. 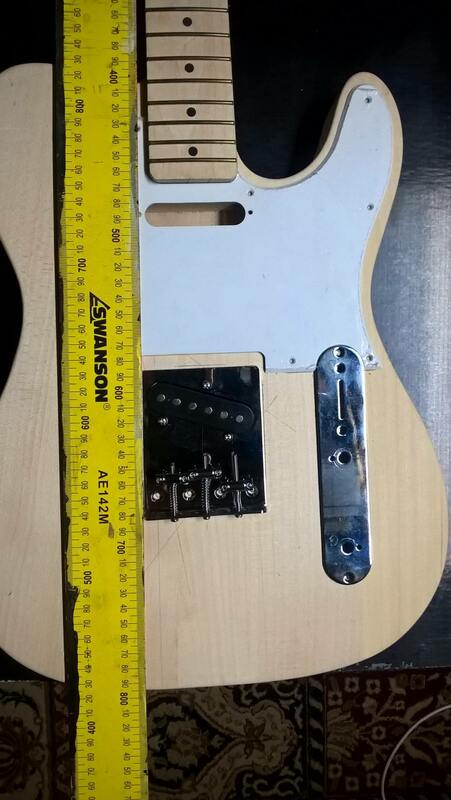 If I carve out the cavity enough to move the bridge I will have to also cut away a portion of the pickguard because the bridge will overlap it if moved into a correct position, though to be honest I don't have the tools to do either really. Main reason I went with a kit guitar as my access to wood working tools is very limited. It is a ATL-1SB “THINLINE” ELECTRIC GUITAR KIT. It sounds like the old "Bridge Rout too far back" problem has raised its head again. Where are you based Josh? One of the other experienced forum builders might be nearby that can help out. The alternative is to flick this back to Adam at PBG to see if he can remedy for you. It sounds like the old "Bridge Rout too far back" problem has raised its head again..
That's what I'm thinking, but if the bridge is moved forward it overlaps the pick guard, which is the first time I've seen that problem. Normally the gap between bridge and pick guard is too big and needs reducing anyway. Does the neck have an overhang? This is a 21 fret, no overhang. and this is a 22 on my Sonicaster with an overhang, you can just see it above the humbucker. If you have 22 frets and no overhang, then as you suggested above, perhaps the neck is not the right match for the body. Again, never heard of that, but there are often oddities in these kits. While the kits are a pretty good start point, it's not uncommon to have to do some rectification of various issues along the way. A lot of the problem appears to be due to the supplied 6-saddle bridge. The saddles just seem to me to be way too far away from the bridge pickup. On my Fender Korean Tele, the top E saddle is about 20mm away from the corresponding edge of the pickup. You're about 5mm away from achieving that at 25mm even with the saddle as far forward as it will go with only a bit of thread left in the hole. Is this a through strung bridge or a rear-loading one? If through strung with pre-drilled holes, you're rather stuck as to bridge position, regardless of the pickup rout position. One solution would be to find some longer threaded machine screws of the right size. I'm afraid I have no idea what they'll be, but hopefully they will be a standard metric thread, probably either M2, M2.5 or M3. But you may then also need longer tensioning springs. I was contemplating just buying a different bridge with saddles that are much closer to the pickup. I don't have the tools to modify the body and pickguard. Just unfortunate that I have to spend additional money to replace parts just to get it to work. Luckily no bridge holes are pre-drilled so installing a different bridge won't be an issue.